Process Displays was founded as a screen-printing sign maker in 1929. The original home of the company was a rented space on 4th Street in Milwaukee. The company designed and manufactured signs and displays. By 1937, the company grew to 15 employees and outgrew its 4th Street location moving to a location on North Water in Milwaukee, Wisconsin. Soon after, they moved to South 6th Street in Milwaukee where they would remain for 20 years. Process Displays thrived throughout the 50’s and 60’s when significant inroads were made into the petroleum marketing industry. In 1957, a large contract was negotiated with an oil company for promotional signage programs. By now the company had 30 employees in its 18,600 square foot plant on 6th Street and plans were underway to move the growing company to a much larger plant facility. In 1967, Process Displays moved into a new building on West Rogers Drive becoming the very first occupant of the New Berlin Industrial Park. A 20,000 square foot addition was added to the south of the building just one year later and state of the art screen printing equipment was added. Going into the 1970’s the company was riding high on strong volume from the oil industry. The company acquired Universal Decalcomania in 1968 and expanded the decal division in the 1970’s. The Arab oil embargo of 1973 shocked the company as all the major oil companies cancelled advertising contracts. Facing a dramatic financial downturn, the company looked for more diverse accounts. The company continued to grow throughout the 1980’s as a new press room addition was added to the plant. The employee group grew to 70 people and 2,400 square feet of additional office was added in 1986. In 1985, Process Displays purchased Kinart Industries. Building on its historically strong base in the petroleum, tobacco, soft drink, and beer marketing categories Process Displays continued to add more diverse accounts. Building on the success of previous decades, Process Displays continued to prosper into the 1990’s. The company would build on its strong client base in the tobacco, beer, toy, and soft drink categories. The company expanded into the lottery marketing segment doing business with over half of the state lotteries. New accounts in more diverse market segments continued to be added. In the mid 1990’s, the company started a new division called PD Technical Services to offer its manufacturing capabilities to OEM markets. Additionally, the company entered into a joint venture with Frontline Displays of the U.K. to market point of purchase design and manufacturing services to the European market. The company was stable throughout the 1990’s maintaining about 60 employees. In December of 2000, Process Displays was sold to a new ownership team of two entrepreneurial businessmen. Under new ownership and leadership, Process Displays changed strategic focus away from its manufacturing roots and toward providing strong front end creative services to solve customer retail marketing and merchandising problems. Since the organizational change, the company grew dramatically more than doubling its size in the decade following the ownership change. The company has maintained its historical printing and manufacturing capabilities and further developed a strong local and foreign supplier base in all permanent display disciplines. In 2001, Process Displays acquired Gateway Displays of Bridgeview, Illinois. The Gateway acquisition introduced two new major accounts to Process Displays. In addition, the growth of a national sales force after 2001 brought significant new major account additions. During this period the company won over 12 Outstanding Merchandising Awards including a Gold Award in 2004. The company celebrated its 75th Anniversary in 2004. The addition of an Asian sourcing division, Process Asia in 2004, was followed with the addition of Process Logistics in 2005, both leading the way to more integrated client partnerships. In 2006, the company opened a state of the art Retail Design Center. The second decade of the 21st century marked an important crossroads in the company history. In 2010, Process Displays changed its name to Process Retail Group and moved into a new custom built headquarters facility. The company continued to grow and expand into new markets during this period achieving record high revenues and eclipsing over 100 employees. The company name change was planned for years to coincide with the physical move to new company headquarters. The company trademarked a new name that more comprehensively reflected the evolution of the company into a total solution provider of custom retail environments. The name also provided a better long term platform for company growth. At the same time, the company began to operate in three distinct market segments: standard POP items, custom commercial segments and specialty on-shelf merchandising systems. The 136,000 square foot facility features a state of the art Retail Design Center and an integrated manufacturing facility. The building was LEED certified by the United States Green Building Counsel and the office space won a Silver Interior Design Award from the Wisconsin Chapter of the American Society of Interior Designers. 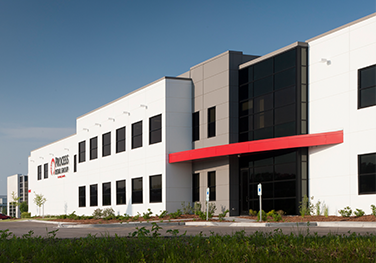 The company was recognized as a Top Employer in 2010, 2011, and 2012 by the Milwaukee Journal Sentinel. Companies are selected after a confidential employee survey conducted by Workplace Dynamics. Process Retail Group was only one of 35 Southeastern Wisconsin companies to win the recognition three years in a row. Over the years the company was recognized for particular strengths in employee communications, operational execution, and company management. In 2012, Process Retail Group acquired Accent Industries in Kenosha to cement its entry into the retail fixture market. The company had been subcontracting wood and metal fixtures for years, so the integration of this manufacturing was a logical expansion of the business. Accent Industries had a rich history in the production of fixtures for grocery store chains and was quickly assimilated into Process Retail Group as a fourth business unit. In 2016, a new President and CEO joined Process Retail Group and the products, services and market segments served continue to grow.